It’s that time of year again: fire performance insurance through Specialty Insurance is set to renew on MONDAY, APRIL 25, 2011, so be sure to get your renewal/application form and policy check in the mail. You can find the application here. The 2011-2012 policy period will run from April 25, 2011 – April 24, 2012. Insurance for this 12-month period is $215. Please note: Specialty Insurance does not accept debit or credit cards, you need to send a check or money order VIA mail service; expect processing to take about a week. There are also 6-, 3- and 1-month policy periods at a sliding scale cost. For those who prefer to purchase insurance on an event-to-event basis rather than annual coverage, the cost for insurance is $125/per person per event, and once issued, the certificate of insurance will expire after seven days. So if you’re looking to perform more than once a year, the annual coverage policy really is your best bet. The policy isn’t cheap, but that’s the thing about insurance – no one really thinks that they need the coverage, until they do, and suddenly they’re staring at a potentially enormous pile of liability costs. So protect yourself and protect the community: renew your performance insurance today. Lakes of Fire tickets on sale today! Tickets for Lakes of Fire, the Great Lakes Regional Burning Man event, go on sale today at 12pm EST. Go here to Black Rock Tickets to make your purchase. Please note: There will be absolutely no ticket purchases at the event gate! Tickets sold out last year well ahead of the event, so get ’em while they’re hot! I attended Lakes of Fire last year – it was my first Burning Man event ever – and the experience was amazing. The creativity on display was inspiring and the atmosphere was as friendly as you could hope for. Although by the end of the festival I was DYING for a shower. Thankfully this year there will be an actual lake to go swimming in! Lakes of Fire 2011: Anima Mundi is an outdoor art and camping event occuring at Lucky Lake campground in 3977 W. Wilke Rd., Montague, MI 49437. Event dates are Noon, Thursday June 23 – 3:00 PM, Sunday June 26, 2011. Read and follow the survival guide to prepare for this event: http://www.lakesoffire.org/survival-guide/ . We are a 100% volunteer produced event and count on your participation to co-create Lakes of Fire. Your art, workshops, theme camps, and volunteerism make Lakes of Fire. This is a Leave No Trace event come prepared to handle all of your own survival and comfort needs and to remove and properly dispose of all of your own trash and recycling. Chicago’s schizophrenic weather patterns strike again. The organizers have regretfully decided to cancel the April FMJ. The rain/snow/slush from the last few days have left the field at the Foster Lakefront park a mudpit and it’s going to be COLD with temperatures predicted in the high 30s and wind gusts up to 30mph. Neither are going to be ideal conditions for spectators or performers (and will the slipperiness of the ground it’ll be downright dangerous). The next FMJ is scheduled for sunset on TUESDAY, MAY 17. So apologies, everyone. I know lots of us have been looking forward to the jam but an April start just isn’t in the cards this year. 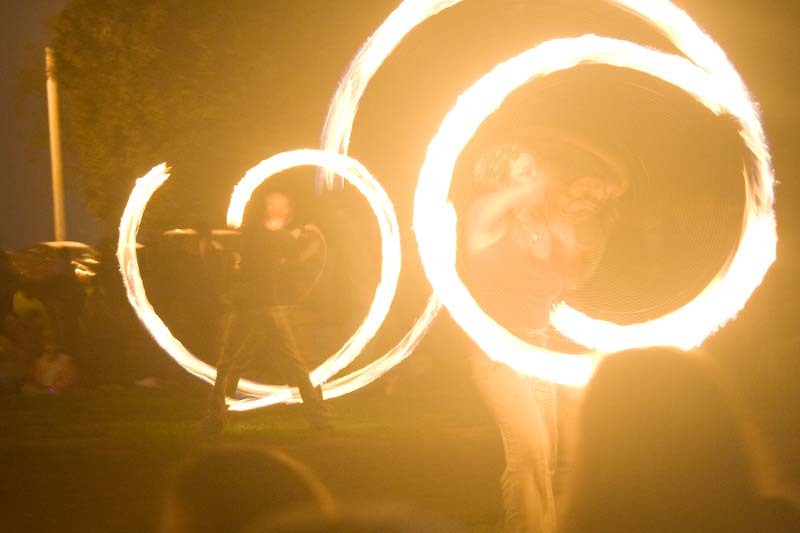 Hopefully the weather gods will be in a much more amiable mood next month because we’re going to start off the 2011 fire spinning season right! We regretfully send this email with the sad news. The April Full Moon Jam is canceled. We had to cancel the jam this month due to the combination of the extreme wet conditions of the fields (they are a mud pit right now) and the cold weather (40 degrees). All of us have been super excited and waiting for the jam to happen all winter long. We must be patient though and allow Spring to take its course. We look forward to seeing everyone next month on Tuesday May 17th for next Full Moon Jam. Enjoy a nice relaxing Sunday, at home, in the warmth with a cup of hot coco. Chicago FMJ 2011 season is almost here! It’s been a LONG, dreary winter, but the time of long nights and gray skies and snowpocalypse is nearly done and Spring is almost here! And you know what that means – FIRE! The Chicago Full Moon Jams will be back next month, starting Sunday, April 17, 2011 (weather permitting). I’ve posted the 2011 schedule here. So dust off your picnic blankets and join us as we chase away the last of the winter time chill with music, dancing and flames! Ok, so October went by much faster than I thought! Luckily, it’s because it was a busy month and I’ve got quite a lot to catch up on. So apologies for being so quiet, but hopefully you’ll have caught at least one of my performances over the past month! Not the least of which was the Big Daddy of them all: the Halsted Street Halloween Parade in Boystown. The parade is a long-standing institution, and for the past seven years, the Chicago fire spinners have been proud participants. This was my second year marching in the parade and it was even better than the first. Not only was there a stellar turnout by the fire spinning community, this year we even had a float – several spinners performed on top of the Cobra bus as it made its way down Halsted Street. Following the parade was a choreographed performance on the mainstage with Solaire Fire. Now, these guys are amazing and I’m honored that I was given the opportunity to share the stage with them. The 16 minute set was comprised of 8 performance sets presented by 6 performers using palm torches, poi, staff, double staff, sword and fans. I’ve broken the video up into 2 parts since it’s so long, but it’s worth watching them both all the way through (and I’m not just saying that because I’m in them!). So that closes out the fire season in Chicago for 2010, and we certainly went out with a bang (it almost makes up for the soaking we all got during the October Full Moon Jam). For the most part, the bitter cold of the Chicago winter makes fire spinning a rare occasion, but if I hear of any, I’ll be sure to post it here! A BIG thank you to my fellow performers – Andrea (palm torches & fans), Julia (palm torches & poi), Dietrich (double staff), Shorty (poi & hoop), and Jodie (poi & staff) – for inviting me to join you. Thanks to Zan Franzoni (also with Solaire) for organizing the fire community for the parade and setting up the performance. And last but not least, thanks to the parade organizers & Boystown community for allowing us to share fire with you during this fantastic neighborhood tradition. Wow, how time flies when you’re busy! My last post was weeks ago, but luckily it’s been due to being inundated with gigs and a hectic schedule and not my general lackadaisical nature. I’ll be posting about the gigs I had over the last several weeks separately, but the big news is: the Chicago Full Moon Fire Jams were profiled by an Associated Press reporter, Martha Irvine, and her video essay has appeared on multiple news sources nationwide! Ms. Irvine attended the September FMJ and the footage she’s compiled is fantastic. It’s a great snapshot of what the FMJs are like and of the people involved. I’m so proud to say that I was able to recognize almost all of the faces in the video and can call many of them friends, including: Liz Campanella (one of the founders of the FMJ and Pyrotechniq troupe member) and her husband, Devin Breen (also from Pyrotechniq, doing staff); Mitch Davidovitz (Phoenix Underground); Ryan Brandoff (spinning poi in a fedora), AshleyPants (hooper extraordinaire), Andrea Matteson (of Solaire, doing fans and double staff), Michael Trahey (spinning poi), Lance Johnson (spinning poi) and Amy Willen (providing us all with fire). And yes, there’s even a quick shot of me, lighting up my fire sword (I’ve nicknamed it “The Beast”). So thank you, Ms. Irvine, for putting together a wonderful portrait of our fire spinning family. We hope you come back again to join us at future jams. I’m so thrilled that our community has been featured in such a fantastic light, and count myself as immensely lucky to be part of it all. Congratulations on the exposure, Chicago Fire Tribe! You look amazing and deserve recognition for all that you’ve done to bring the jams to where they are today! It’s a good thing I got some relaxation in over Labor Day weekend, because it looks like September’s going to be busy! I’m thrilled to announce that I’ve got three, possibly four, gigs already lined up for this month – and that’s in addition to the September Full Moon Jam. 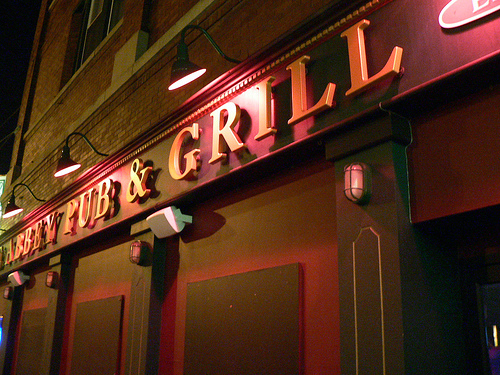 Coming up tomorrow night at 8pm, I’ll be spinning LED poi and flags to the exotic folk & jazz stylings of the lovely Dawn Xiana Moon and her trio at the Abbey Pub in Irving Park. Tickets are $8 pre-show, $10 at the door. It’s drummer Joe Chellman’s last gig with the Trio, so if you haven’t seen them perform, don’t miss this! He’s an amazing drummer and we’re going to send him off with a bang. Oh yes – you might get on TV if you come, too! In two weeks, on Saturday, September 18, I’ll be performing at the Grand Opening celebration of my favorite local cafe, Senem’s Coffee and Tea House (you can even check out my review of Senem’s on my personal blog, Magpie’s Marbles). There will be a whole line up of entertainment for the day. Senem is a lovely woman and her cafe is a hidden gem in East Lakeview/Wrigleyville, so come on by, support a wonderful addition to the neighborhood, and enjoy some of the best Turkish coffee and mint lemonade in the city. Finally, I’m thrilled to have been invited to perform at il Carnivale e Stage Left – the Fall Season kick-off event for the Stage Left Theater – on Friday, September 24, at the Mars Gallery. Stage Left is a fantastic Chicago company with a focus on producing political and social theater and providing a supportive venue for new visions. Like all small theater companies, they depend heavily on public support, so join us for an evening of frivolity, celebration and unique entertainment. Advance tickets are $50 and $60 at the door. The month is still young, so hopefully there’s more to come! August Full Moon Jam is here! Come out tonight and enjoy the best kept secret in Chicago community entertainment. When the sun goes down around 7:30pm, the gathering of Chicago and nearby Midwest area fire spinners will commence with music, dancing and of course – FIRE! Many of the performers are preparing to head west to Burning Man, so help us give them a fantastic send off on their journey to Black Rock City. I just finished wrapping the hilt of my fire sword with gaffer’s tape to improve the grip. I can’t wait to break that bad boy out tonight! The jam takes place in the park along the lakefront just SOUTH of Foster Ave (NOT Foster Ave Beach). There is parking along Simonds Drive or you can take the Red line/151 bus/146 bus to Argyle and walk EAST through the park and under Lake Shore Drive. Bring friends, family, a picnic blanket and your camera. No alcohol, please. Remember, this is a Leave No Trace event – you pack it in, you pack it out, and if you see any trash on the field, please help out by throwing it away. The jam will end promptly at 10:15pm. Please be aware that the police will hand out tickets if you are in the park after it closes at 11pm. The jams are not sponsored by the City of Chicago. They are FREE events organized by the fire spinning community so that we can share our art and passion with others. Hope to see you there!